Unstructured data is growing exponentially and the high performance computing industry is leaning towards parallel storage file systems but how do you take advantage of SSD flash performance while being cognizant of budgetary restrictions? Be the first to experience our ARI Series of Hybrid storage arrays designed for large-scale unstructured data parallel file systems like; Lustre, GPFS, Gluster, BeeGFS, etc. Tune in for an intuitive presentation of Automatic SSD Tiering for the ARI hybrid storage platform. The RAID Inc. team of experts have acquired extensive academic, research lab and enterprise performance-tuning expertise developing far-reaching industry relationships, making RAID your trusted HPC industry leader. 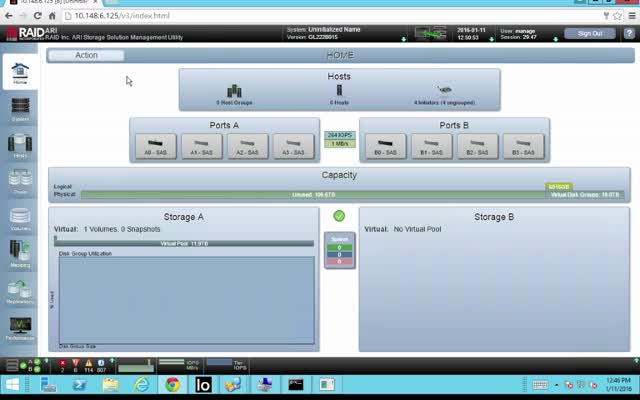 Rich Brueckner at InsideHPC discusses the RAID Inc Lustre-tuned cross-platform dashboard. This file system agnostic analytical tool enables centralized self control over the full range of computing resources, such as Lustre ZFS and Intel® Enterprise Edition for Lustre. Lustre Over ZFS storage solutions offer greater performance for HPC technical computing, cloud, big data center and high density elastic storage. Lustre with ZFS brings a robust, scalable file system with features not available in other file systems. ZFS enables economical storage for Lustre solutions. RAID AID provides a comprehensive set of metrics using open-source protocols to measure, monitor and alert for example, monitoring IOPS, latency, capacity for mission critical applications. The AID tool intelligently provides a real-time optimized pipeline in which overlapping workloads run efficiently, reliably, and at the lowest-practical cost. Rich Brueckner at InsideHPC and Brad Merchant from RAID Inc.
InsideHPC's Rich Brueckner and Brad Merchant from RAID Inc. discuss the Intel Lustre ZFS solution. "RAID Inc. offers a suite of building block product families that can be purchased individually or in conjunction with other RAID products to solve customer’s needs in the most demanding data-storage environments. As the leader in large storage systems, RAID Inc expert engineers can provide the massively scalable open source Lustre on ZFS file system. Lustre has become the de facto choice for HPC, Bio-Science, and real-time Big Data analytics with a better than 50% share of the HPC storage market. RAID Inc. working as partners with the Intel® Enterprise Edition of Lustre team has successfully deployed Lustre on ZFS solutions with up to 180 GB/s performance for better than 17 petabytes capacity. These Intel® supported deployments of Lustre are based on RAID Inc. vendor-agnostic storage platforms to reduce storage costs by better than 50% versus traditional storage. Deep Dive into Fine-Tuning and Best Practices for Managing Storage Spaces Direct (S2D). Demand for virtualization and storage continues to advance towards a cloud-consistent Software Defined Data Center (SDDC) architecture and Microsoft is unlocking the value of hyperconvergence with Windows Server 2016 and Storage Spaces Direct (S2D). Prominent architecture advancements to WS2016 Datacenter Edition include an Azure-inspired networking stack, Nano Server and Shielded VMs with storage enhancements; Storage replica, Storage QoS, and Storage Spaces Direct. Windows Server 2016 introduces the distributed file system design known as Storage Spaces Direct (S2D), which expands upon Storage Spaces Shared (WS2012 R2) to encompass support for both SATA / SAS drives, including high-performance NVMe flash devices, that reside internally in each server. Recognizing S2D is a vital cog to the Software Defined Data Center, a holistic approach is needed for success from design to implementation to management. This presentation is designed to give a perspective on Storage Spaces Direct and its impact on your hyperconvered SDDC environment, with commentary directly from Microsoft, a Microsoft TAP partner ClearPointe and Storage Spaces founding partner RAID Inc. Also see best practice high performance NVMe-tuning techniques as seen demonstrated in the Microsoft Ignite booth. In an effort to further prepare for the future of Cloud storage, tune-in for the discussion addressing how management and monitoring tools can translate directly into a model that scales into Azure Stack, and therefore Azure, to create a harmonious hybrid ecosystem that can scale and work together across on premise and cloud environments. Lustre delivers an incredible level of performance, flexibility and scalability for better than 60% of the TOP100 supercomputing sites in the world. As the leader in large storage systems, this massively scalable open source file system has become the de facto choice for HPC, Bio-Science, and real-time Big Data analytics. This tested and proven Lustre platform currently owns a better than 50% share of the HPC storage market. RAID Inc. working as partners with the Intel® Enterprise Edition of Lustre team has successfully deployed Lustre on ZFS solutions with up to 180 GB/s performance. This Intel® supported deployment of Lustre, based on RAID Inc. storage platform can reduce storage costs by better than 50% versus traditional storage. Also in this webinar RAID Inc. will cover an architectural overview and technical deep dive into the real-world 17PB (petabyte) deployment at Lawrence Livermore National Labs with its custom-tuned Lustre on ZFS design. Join this webcast to learn Lustre on ZFS deployment tips and tricks in building an efficient and resilient environment at scale. Brent Gorda is the General Mgr. for HPC Storage in the High Performance Computing Group at Intel. Keith Mannthey is a Lustre Solutions Architect working in the Intel High Performance Data Division of Intel. Brad Merchant is a Senior HPC Engineer at RAID Incorporated. Short demo presenting the RAID Inc. ARI Series Hybrid storage arrays - Helping Users Create Virtual Volumes. The ARI Series storage array is an ideal storage platform for parallel file systems like; Lustre, GPFS, Gluster, BeeGFS, etc. Demonstration of the RAID Inc. ARI Series Hybrid storage arrays - Populating Storage Pools Walk Thru and how to add tiers on the ARI Series parallel storage platform. Demonstration and short presentation of the RAID Inc. ARI Series Hybrid storage arrays - Easy Setup Configuration Wizard. Since 1994, RAID Inc. has developed custom end-to-end vendor-agnostic technical computing solutions addressing high performance computing and big data storage challenges for various vertical markets including; High Performance Computing, Life Sciences, Bioinformatics, Financial Services, Oil & Gas, High Tech, Hosting, Media & Entertainment, Government, Education, and Healthcare. The RAID Inc. team of experts’ have acquired extensive academic, research lab and commercial expertise and far-reaching industry relationships making RAID your trusted industry leader. High Performance Computing & Big Data Center demands on storage can be crippling. New software-defined storage architectures such as GPFS, Lustre on ZFS, BeeGFS, Microsoft’s Storage Spaces, object storage, and other scale-out NAS platforms for unstructured data cloud the issue on which architecture best fits your needs. This channel will highlight the RAID Inc. vendor agnostic philosophy in delivering you technical computing advice and leverages decades of customers success stories.